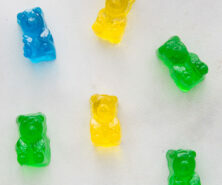 Did you know you can make your own gummy bears with only a few ingredients? We are sharing this easy to make gummy bear recipe with you today. And we’re showing you two ways to make them! You can make them with fruit juice or with JELLO (flavored gelatin). Both methods are really easy to make homemade gummy bears. We hope you try them both! We knew we wanted to share a gummy bear recipe with our followers but we couldn’t decide which version of the recipe to share. We held a poll in our Facebook Group and there was an overwhelming response for the fruit juice version. However, there was still interest for the JELLO version so we decided to share both! Our kids actually preferred the JELLO version but they also liked the fruit version too. 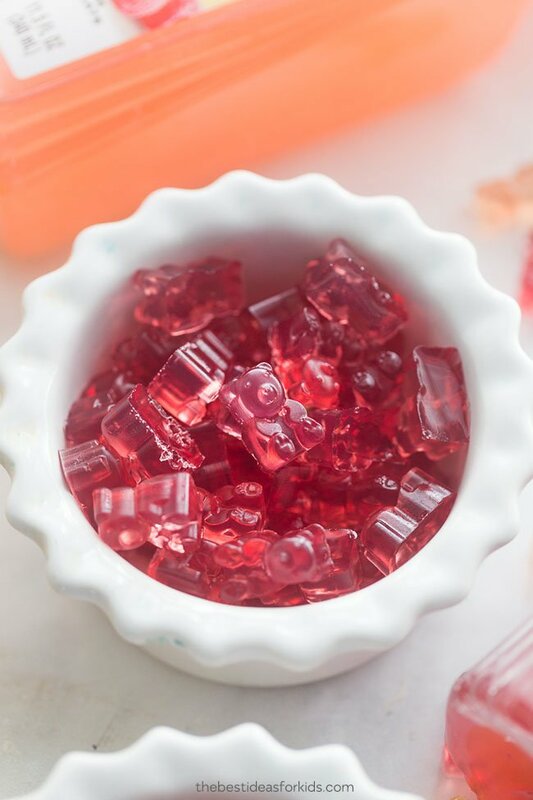 If you have gelatin, JELLO or fruit juice on hand you can easily make these! The only thing you’ll need to get in advance are the gummy bear molds. 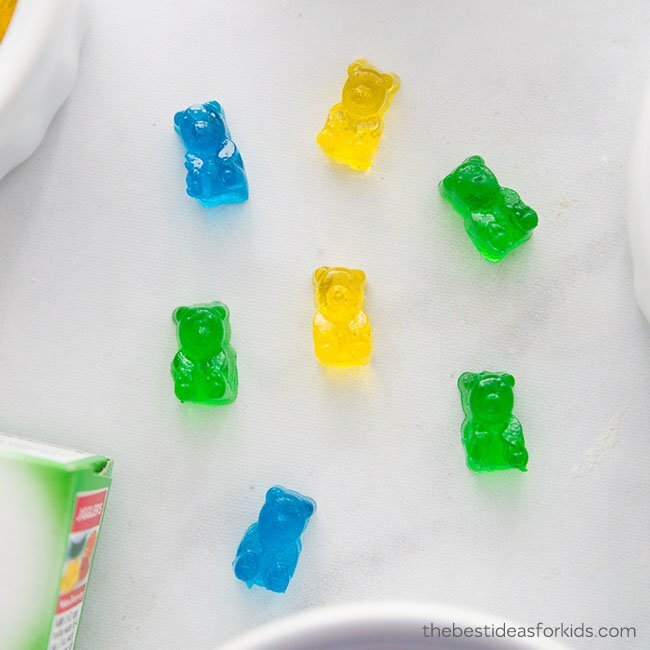 Kids will not only love eating these gummy bears but they’ll also love helping to make them! Our 4 year old had fun using the droppers to put the recipe into the molds. 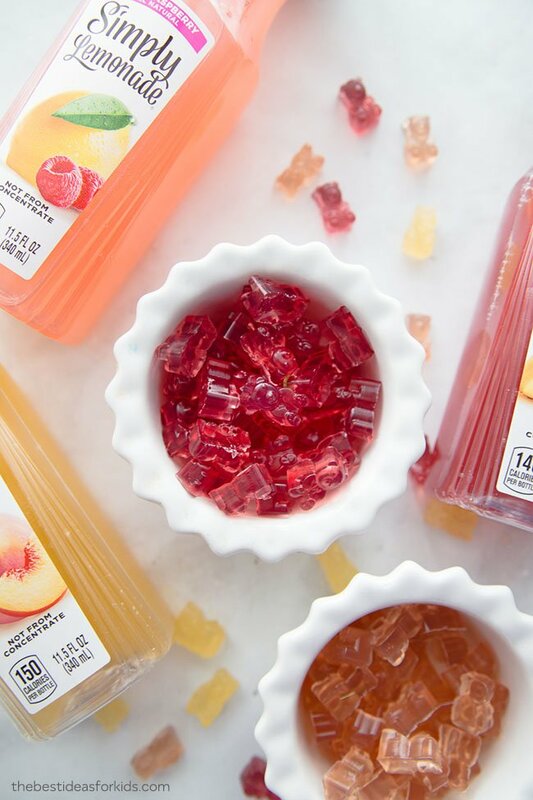 We’re sharing two ways you can make your own homemade gummy bears. Let us know which one you try and which one is your favorite! 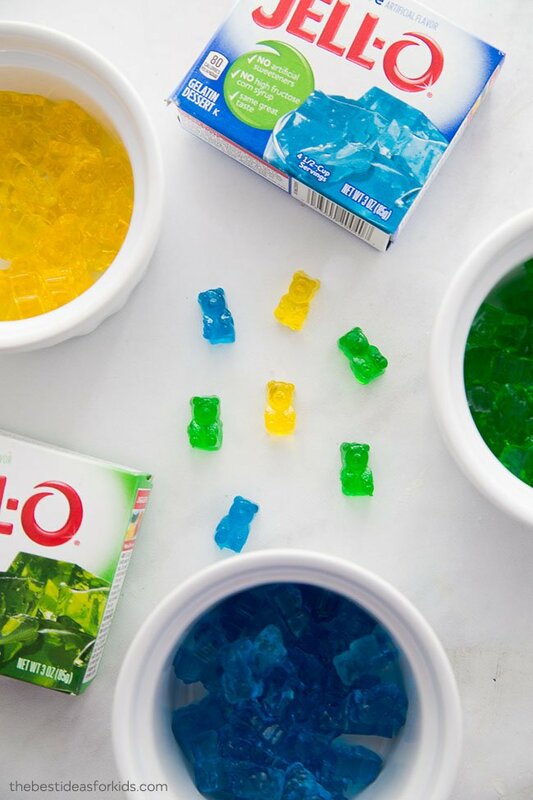 To make homemade gummy bears with JELLO you only need a package of JELLO and some gelatin. The easy thing with this recipe is that you don’t need to worry about how to sweeten it. Our kids loved this version because JELLO is sweet. We also love how bright and colorful the JELLO versions turned out. If you have extra JELLO boxes lying around the house this is a perfect way to use up the box! Note: You can get Vegan Gelatin – this brand is a 1 for 1 replacement. Another option is Agar Agar Powder but we haven’t tested this with our recipes. Tip: Try to avoid getting bubbles in your dropper when placing in the mold. If you end up with bubbles on the top, that’s ok but the bubbles will solidify that way. We had some bubbly ones and the kids still thought they tasted good. Place in fridge for 30 minutes or until solidified. Once they are hard from the fridge you can easily pop them out of your mold. If you find them hard to take out of the molds, keep longer in the fridge to make sure they are full solidified. We tested a lot of versions with fruit juice. We tried different sweeteners and out of them all honey was our favorite. We didn’t try with regular sugar as we wanted this version to be sweetened naturally. Note: If you want to avoid all added sugar from using store bought juice you can make your own juice with real fruit instead using a juicer. If you want to substitute the honey for regular sugar we would recommend you add a little bit of sugar to start and then taste-test before filling your molds. Note: Reminder that honey should not be given to babies under 1 year old. You can also use Stevia but only the liquid drops. We tried with the powder version and the recipe did not turn out. We also tested Agave syrup but we personally did not like the flavor. The final option to sweeten naturally is you can use maple syrup. However, we liked honey the best because it’s sweet but the flavor is not too overpowering. For juices we recommend any clear juices – the ones we used are called Simply Lemonades. You can also use cranberry juice or apple juice. Keep stored in the refrigerator and they should last at least one week (but will usually get eaten up before then!). Watch the video before you get started! Here are the directions for the fruit version – you can print the recipe off here too! 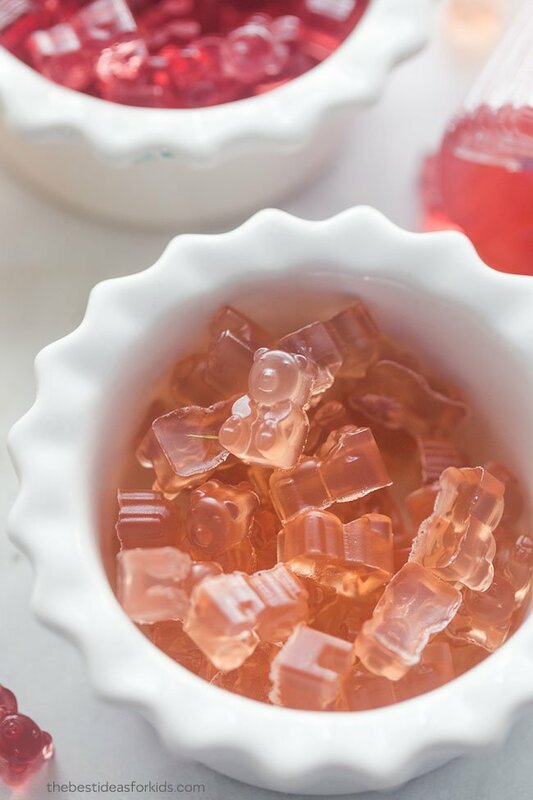 Homemade gummy bears made with fruit juice and honey. Pour 1/2 cup juice into a sauce pan set on low heat. Add 2 tablespoons of gelatin. Mix until all dissolved and then remove from heat. Using the dropper, add into your mold. Place in fridge for 30 minutes to cool and form or until solidified. Note: You can substitute the honey for maple syrup or stevia drops. Test a small amount and taste for sweetness to your liking. For the JELLO version, see instructions above. 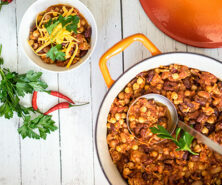 Storage: Keep stored in the refrigerator and they should last at least one week. 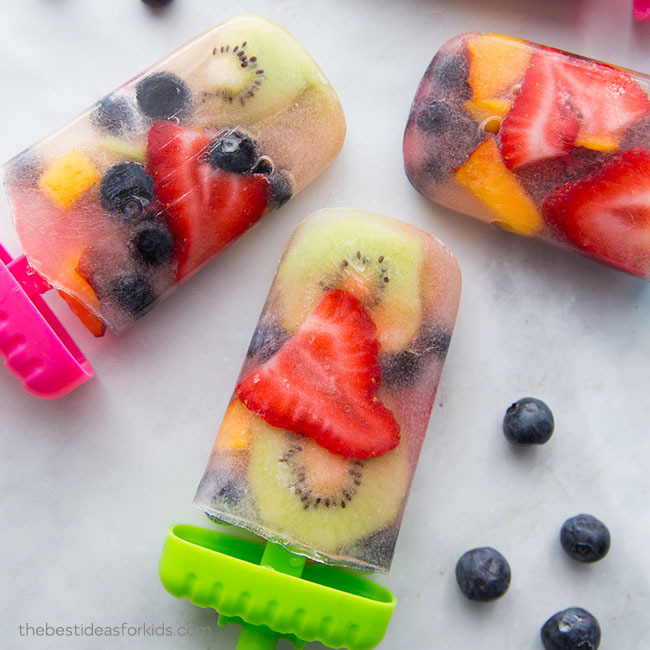 For a healthy snack option for kids, see these fruit popsicles – kids love helping to make these and they are perfect for a hot summer day! I see previous comments about keeping in the fridge but I was hoping to make and mail them to my grandson. Did you know if anything can be added to the recipe too allow for a couple of days for shipping? I would be worried about mailing them since if they get hot they may melt. If you are in a colder climate they may be okay. I’ve seen other recipes that use more gelatin. I’m sure the addition of gelatin would definitely add to the stability of the gummy. We tested with more gelatin and found the texture a bit too hard for our liking but it’s definitely a personal preference! If you find it’s too soft test adding a little more in and that will harden them up more. What kind of juice did you use? We used Simply lemonade and cranberry juice. The Simply lemonade was our favorite – it gives it a more sour taste from the lemonade. These look very yummy! Thank you! 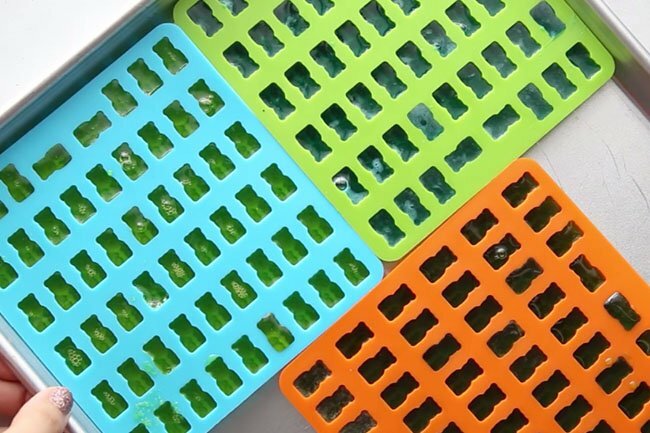 Where can get the Gummy bear mold? Hi Alma – we link to the molds in the post above from Amazon. For the jello recipe it says half a cup of water. That’s less than normal package instructions. Does that mean we’re not to follow the package? Also is the extra gelatin so it’s more gummy like rather than jello? 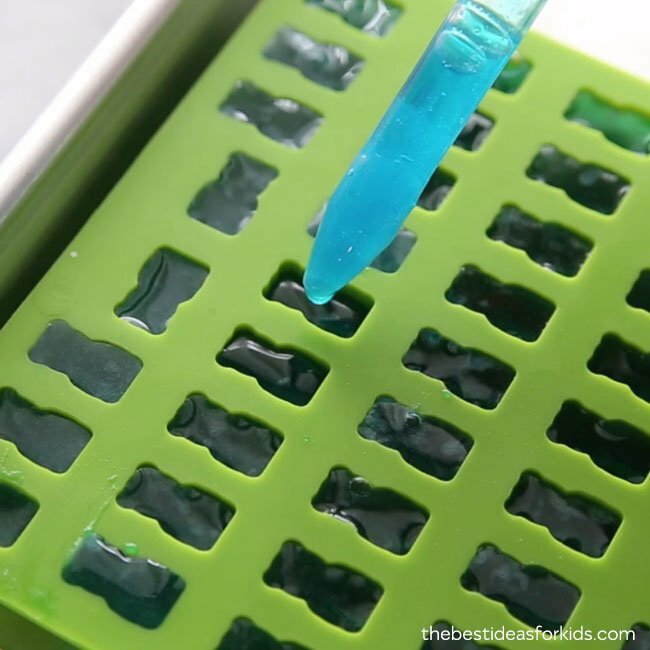 I know it will depend on the mold used, but with the mold shown in the video, how many gummies does the recipe make.? Where can I purchase the mold? What makes the store bought gummy bears ok out of fridge? I love this idea but it isn’t too practical if they will melt into a puddle in a container on way to school or on an putting for a treat. They shouldn’t melt into a puddle if you leave them out, it just helps them keep longer. They don’t have preservatives like the store-bought kind do. Love this! Once they are solidified do they have to be kept in the fridge? Thanks! Yes sorry we forgot to mention they should be placed in the fridge! We just added that to the post. Thank you!